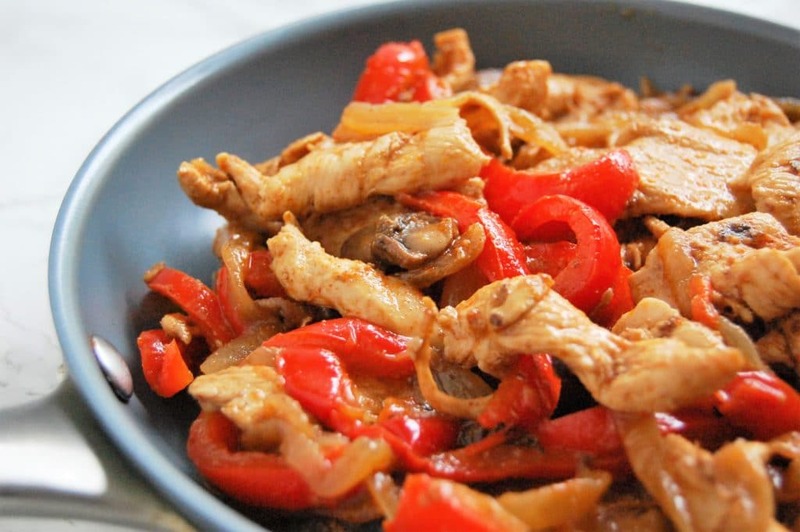 This Fajita Chicken is a simple, crowd-pleasing recipe that freezes super well. You can easily double or triple the batch, freeze, and reheat leftovers for a fast family dinner in less than ten minutes! As everyone gets busy with getting back in the routine of school and the sudden influx of parent-teacher conferences, open house nights, homework, practices, and all sorts of extracurricular events, getting the whole family to the dinner table can be a lot harder! Because of that, easy make ahead/ prep ahead meals have become a number one requested topic lately. I am all about quick meals where easy preparations in advance can save me a ton of time in the moment. I may not be running around chauffeuring kids to different after school activities, but at 34 weeks pregnant, tired after ten hour work days (and this crazy heat!) and juggling doctor appointments, hospital tours, and more, I can certainly appreciate the desire for a quick meal at home! This meal is one of my favorites. It comes together very quickly and is easily multiplied to make large batches. Not to mention, it’s delicious and a total family favorite! Every time we make this fajita chicken I usually at least double the recipe. I like to freeze leftovers – sometimes I’ll freeze individual servings in small baggies so I can grab a portion, throw it in my lunch cooler and it’s easily reheated and added to a tortilla or a bed of spinach for lunch. I also will freeze multiple servings for those easy dinners. If it’s super last minute you can take it straight from the freezer to the microwave. 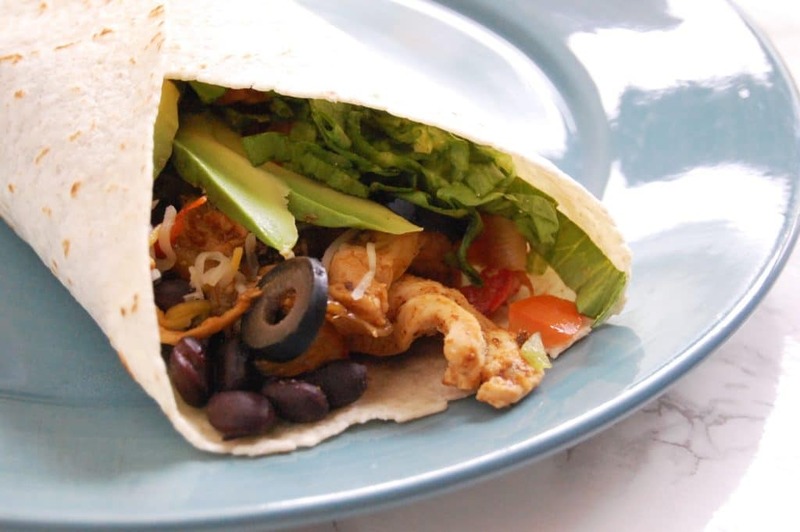 While the chicken is thawing and reheating you can chop some lettuce, tomatoes, avocado, open a can of black beans and prep whatever you need for fajita/ fajita salad toppings. Dinner is ready in a flash! 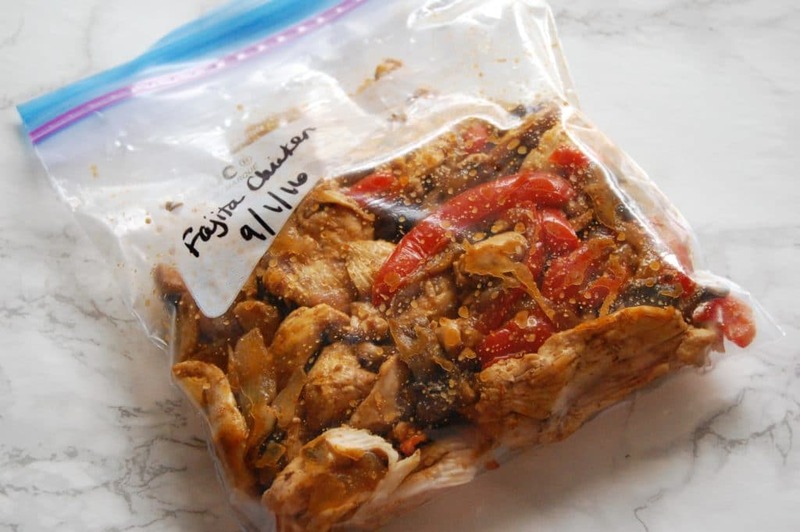 If you don’t want to use a microwave, just be sure to pull out the bag of fajita chicken from the freezer the night before or morning of the night you want to use it. When you get home, simply put the fajita chicken into a large nonstick skillet and reheat over medium heat while stirring occasionally. Prepare your other ingredients and dinner can be on the table in ten minutes! If you give it a try, let me know what you think! I hope you enjoy this meal as much as my family always has! Heat olive oil in a large nonstick skillet. Add the sliced onion and saute and caramelize until golden brown, about 10 minutes. 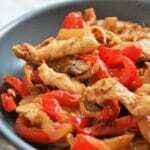 Add sliced bell pepper and sliced mushrooms and saute another 3-4 minutes. Push vegetables to the outside of the pan and add the thinly sliced chicken to the center of the pan. Stir a few minutes, cover, and steam 3-4 minutes. Remove lid and add the seasonings (chili powder, cumin, garlic powder, and salt). Cook 4-5 minutes, or until chicken is cooked all the way through. Add the juice from the lime and cook another 2 minutes. Remove from heat and enjoy! Serving recommendations: use your favorite tortillas or a bed of greens and make a quick toppings bar the whole family can have fun with! 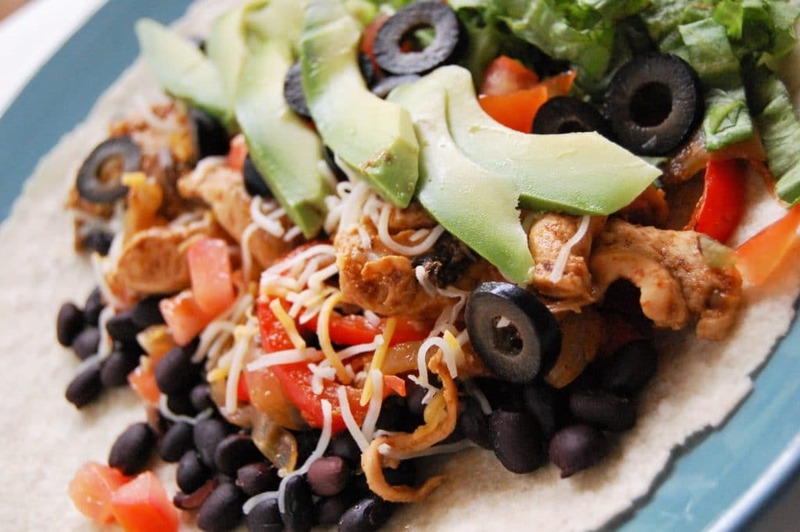 Some of our family favorites include shredded lettuce, diced tomatoes, sliced avocado or guacamole, shredded cheese, black olives, black beans, cilantro, and salsa. Freezer recommendations: freeze leftovers in freezer-safe bags or containers. When re-serving, thaw and reheat in the microwave. Alternatively you can thaw in the fridge overnight and reheat over medium heat in a nonstick skillet while stirring occasionally. So excited to know I can freeze these! We always wind up throwing so much fajita mix out. How long do they keep in the freezer? Hi Meggie! I apologize for taking so long to get back to your comment, I had a pretty big family emergency. If you’re storing in the freezer that is part of your refrigerator, they’ll freeze up to 3-4 months. However, if you have a deep freezer it can freeze for 6-8 months. Thank you!